LANSING — A nonprofit funded by secret donors and connected to Michigan Gov. Rick Snyder ran about $266,309 in TV ads this fall touting Snyder’s record and six Republican State House candidates. The total includes both broadcast and cable ads and is based on the Michigan Campaign Finance Network’s analysis of Kantar Media/CMAG ad-tracking data and filings with the Federal Communications Commission (FCC). The nonprofit is Making Government Accountable, a 501(c)(4) organization that incorporated in March 2015. When it launched, supporters of Snyder said it would be used to help pay for expenses as Snyder traveled the country talking about his work in Michigan and flirted with a run for president. But in September 2016, Snyder’s political team announced a shift in the fund's focus. The Detroit News reported that Snyder would launch an ad campaign to emphasize Michigan’s “comeback” and to boost House candidates whom Snyder supports. 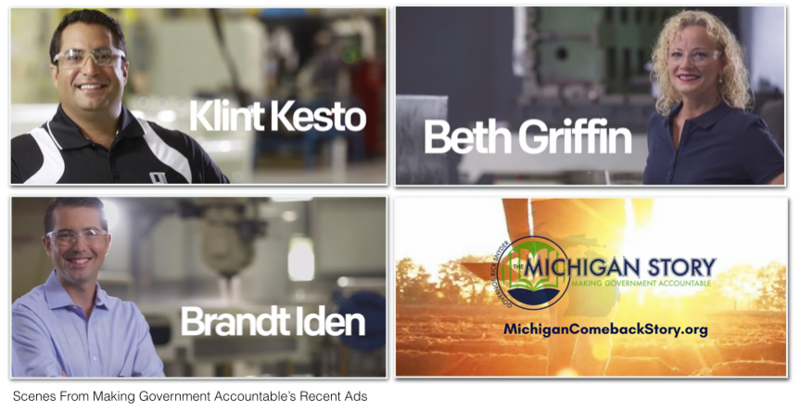 The nonprofit paid for TV ads for the candidates while Snyder’s PAC, the Relentless Positive Action PAC, said in a press release that it would pay for coinciding direct mail and digital advertisements. The PAC discloses its donors to the Michigan Secretary of State. “RPA PAC’s effort is focused on educating voters about the important issues in this election and what is at stake for the future of our state,” Snyder said in a press release from the PAC. The PAC and nonprofit focused on supporting the following candidates: Republican Pam Hornberger, of Chesterfield Twp., in the 32nd District; Rep. Klint Kesto (R-Commerce Twp.) in the 39th District; Republican Bronna Kahle, of Adrian, in the 57th District; Rep. Brandt Iden (R-Oshtemo Twp.) in the 61st District; Republican Julie Alexander, of Jackson, in the 64th District; and Republican Beth Griffin, of Paw Paw, in the 66th District. The nonprofit ran broadcast TV ads in the Grand Rapids market to benefit Iden and Griffin and in the Lansing market to benefit Alexander, according to FCC filings. The Grand Rapids broadcast market saw the most spending at about $127,735. The nonprofit also ran cable ads in all six districts where the candidates are running. Many of the ad spots didn't mention a candidate but just focused on Snyder (as seen below). Donors behind the Making Government Accountable ads don’t have to be disclosed because the ads don’t directly tell voters whom to support or to oppose on Election Day. They are examples of what are known as “issue ads.” Snyder himself signed a bill in 2013 that ensured that donors behind “issue ads” don’t have to be disclosed although the ads mention candidates in the weeks before an election. Making Government Accountable began raising money in early 2015 but still hasn’t released publicly a fundraising total for that year. According to other organizations’ disclosures, Making Government Accountable itself has made $575,000 in contributions to other Snyder-connected accounts. With those contributions and the TV spending alone, the fund has distributed at least $841,000. The Relentless Positive Action PAC will have to report to the state on its spending on Oct. 20. And it’s been fundraising in the last weeks citing its efforts to help GOP State House candidates. In an email to supporters earlier this fall, Kyle Robertson, director of the Relentless Positive Action PAC, touted September media stories that covered the plans of the PAC and nonprofit to boost candidates.